Combined interviews with the Saxophone Colossus from 2006 and 2008. 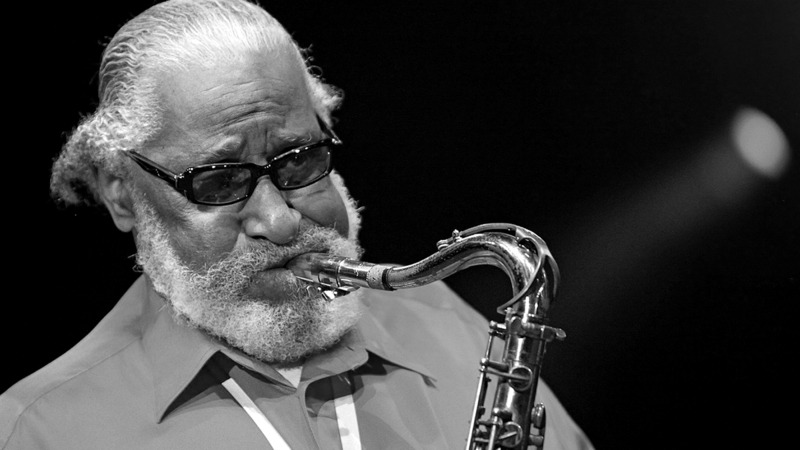 The following conversation took place by phone on March 30, 2006 between Sonny Rollins and Cristofer Gross, who was researching an article to run in The Orange County Register prior to Rollins' April 8 concert at the Cerritos Center for the Performing Arts. The man dubbed the ‘Saxophone Colossus’ in the 1950s was still blowing hard, earning a Grammy that year for ‘Without A Song: The 9/11 Concert,’ preparing to release a new CD, and embarking on a tour that soon took him to Europe. CRISTOFER GROSS: I never thought I’d talk to somebody who played with Clifford Brown. SONNY ROLLINS: [Laughs.] Well I had never thought I’d play with Clifford Brown. I’m glad that we’re both big Clifford Brown fans. GROSS: We’ll get around to him. In the meantime, let’s talk about the band coming in to Cerritos and the program you’ll play. Is this the group from the 9/11 album? ROLLINS: There will be Clifton Anderson on trombone, Bob Cranshaw bass, Kimati Dinizuli on percussion. Those guys remain the same. But I will have Bobby Broom on guitar in place of pianist Stephen Scott, and Joe Corsello playing drums in place of Perry Wilson. GROSS: Is the program you’re performing on this tour the album, new stuff, or just anything you want to hit when you hit the stage? ROLLINS: Well, anything I want to hit when I hit the stage, but we just completed a CD [‘Sonny, Please’] and we’ll probably be performing some of that material. There are seven tracks on the new CD, including four original compositions, a standard and an obscure 18th or 19th Century Italian folk song. GROSS: The ‘Without a Song’ CD was recorded in 2001, a few days after 9/11, but not released until 2005. What was the reason for that timing? GROSS: Well, for whatever reason, the four-year delay seemed to help the album’s impact. ROLLINS: Well, maybe so. As you know my wife was my co-producer and we were trying to get a new effort out there but we just couldn’t do it. I knew it was time for me to put out a new album, so I looked back in my archives and put this out. So you could say it was serendipitous if people like the album. GROSS: Well, clearly people do. Plus, given the role your wife played in insisting that you make the concert that was recorded in Boston days after the attack, it seems a nice way to honor her memory. GROSS: Along with those cowbell tracks she’s laid down in the past. GROSS: Certainly one of your most popular and acclaimed albums was ‘Way Out West. Here in California we’re proud to have been part of that. Do you see a distinction or disparity between East and West Coast musicians or audiences? ROLLINS: Well, I’ve always been of the opinion that the East Coast was more hospitable to jazz. For many years I went out to the West Coast, but it was really the East Coast where jazz was more welcome. And that may have changed, I’m not sure . . . [laughs] about that. ROLLINS: Right [laughs] . . . Well I think jazz is very universal and there are great jazz fans on the West Coast as well as the East Coast. And I certainly appreciate all of them that come to see me play. GROSS: Is there anything you offer to non-jazz people to help them gain appreciation? A particular record that is a point of entry? Or a window if you will? ROLLINS: Well, you know I don’t think in those terms because I’ve been fortunate in that people seem to relate to what I’m doing. Even though I’m sure they don’t really know all of the technicalities involved in jazz, people seem to relate to my playing. It’s quite a heady feeling, but it’s wonderful, you know, that people come up to me and say ‘You know, Sonny, I don’t like jazz, but I like you.’ I seem to get a wide spectrum of people without compromising any of my jazz principles. But I have had a lot of people tell me that from all . . . walks. You know I went to see Sonny for the first time I never heard jazz and I liked it. I get that a lot. So I hope the music can speak for itself. GROSS: Your playing has a linear, storytelling quality. Even ‘free-wheeling’ solos have a beginning, middle and end. When you launch into a solo, do you have an end point and places along the way in your head? Is it pretty much open season? Or is there a combination? ROLLINS:I would say it’s a combination. My style of playing is a storytelling style, and as you observe, I’m a more linear than vertical player. I am a follower of people like Lester Young. It’s part of what I do that I end up telling a story. But it’s also free-wheeling because real jazz improvisation is not really studied. It’s supposed to be spontaneous. You study your rudiments and you have your guidelines and you learn the chords and the structure and all that stuff. But once you’re improvising, you don’t think about those things. You forget about those things and you just improvise. Real improvisation is something that just happens. It’s spontaneous but at the same time it’s not completely free-wheeling. GROSS: Not without a grid underneath it all. GROSS: You mentioned in an interview that you turned on your black and white TV set to see news about the 9/11 attacks that happened a few blocks away. You have little interest in new technologies. ROLLINS: Yeah. I’d have to plead guilty to that. ROLLINS: I haven’t seen that but I guess it’s okay. GROSS: It’s nice. Your practising nights on the Williamsburg Bridge has become one of the great jazz legends. I was glad to see you hadn’t tired of talking about it. ROLLINS: Well, you know, not really. It’s something that happened. And I’m a very tolerant fellow. I don’t mind talking about that. The Bridge story has a good ethical component to it. I went there trying to do something that I thought was important, that I felt I needed to do and it turned out to be a big, big thing. But that wasn’t the reason I went. I had no idea. I didn’t go for that reason. GROSS: It was a personal thing that first worked in that way. ROLLINS: Yeah! It was very personal. And you have to believe in yourself. People have to believe in themselves and not be influenced by this media which tells you that you have to eat Haagen-Daz or you have to wear Florsheim shoes or that you have to drive a Mercedes. You have to think for yourself. If you feel that you want to study your engineering or whatever the case may be, you have to have the strength of your own convictions. That’s the real story of The Bridge. The Bridge is a moralistic tale, really. GROSS: What do you listen to? ROLLINS: I don’t listen to too much music. Because I’ve listened to so much music in my life and I’m sort of at an overload place. And of course I’m always practicing, composing and thinking music anyway. So I don’t get a chance to really listen to a lot of music. I love listening to people. If I’m out in a situation where I can hear people play I really appreciate it. It’s very enjoyable and edifying. But when I’m at home I don’t really take time. GROSS: Given the list of jazz luminaries that you performed with, I’d like to ask for a snap shot or impression on a few. For instance, Clifford Brown. ROLLINS: Well Clifford was really just a tremendously gifted musician. And he was a very humble, nice person. And that was something that impressed me a great deal. GROSS: When you worked with him he was pretty near the end of his life, 24 or 25, and he’d been at it long enough and been revered enough to have become obnoxious if he was going to. ROLLINS: Right. And a lot of people that had that much talent would not necessarily be the nicest people. Oh, you know, everybody’s okay. I’m not criticizing. But you know what I mean. A person with that much ability could be sort have a swelled head and . . . GROSS: Look at you. You seem to have avoided it. People must come up to you and treat you with reverence. I can tell from speaking to you that it clearly hasn’t gone to your head. ROLLINS: Well, I learned a lot of that from Clifford. GROSS: How about Fats Navarro? ROLLINS: Fats of course I was just . . . that’s such a great, great player. I remember my erstwhile pianist Steven Scott had told me one time that Fats Navarro was his favorite trumpet player. And Fats was. He was such a . . . This guy could play anything. I had the opportunity of doing some little gigs with him when I was quite young. Of course I made a recording with him and Bud Powell. That was a great, great height for my career at that point. Really wonderful. And right before he passed away I saw him and he told me, Sonny, I’m starting a band. I want you to play in my band. And when he said that to me it was really, really a great, great boost to my, my . . . well ego is not a good word. ROLLINS: Confidence, that’s a better way to put it. So Fats Navarro was great. Everybody had to acknowledge that he was just a master. And by the way he was Clifford Brown’s idol. Clifford I think patterned himself on Fats. GROSS: How about Don Byas? Not too many people talk about him anymore. ROLLINS: I’d have to agree with Charlie Parker, who said that Don Byas could play anything that is to be played. I mean he was just phenomenal. He was one of my early favorites. Dizzy Gillespie loved him. And you couldn’t deny it because he was just that great a player. When people get his records they can hear that this guy was really something special. Unfortunately he left the stage at an early age and he didn’t really get the recognition that he deserved. But he was phenomenal. I learned a lot from Don Byas. ROLLINS: Coltrane was always a special person. I played with Coltrane in those years but I could never figure out Coltrane’s style. He had a special style. Of course later on everybody began to understand more of his unique approach. But when I first heard him, I mean he was great but I couldn’t figure out what he was doing. But he had so much integrity about his playing. He was also a very humble person, a beautiful person as an individual. But you know what a great musician he is, and how many people he’s influenced. ROLLINS: I was really just blessed beyond belief to have known and played with these guys and been friends with them. GROSS: Jazz is just into its second century. Do you see how it might change as time goes on? Will it break new ground or just work within the established vocabularies? ROLLINS: I think that’s too big a question for me to answer. I just know that the basic component of jazz, the spontaneous improvisation, that part of it is always going to be there in one form or another. What that form is I have no idea. But I know that that element of jazz is something that will always be. What form it will take I don’t know. I’m one of these people who feel that rap music is part of the jazz umbrella and all of this stuff is. I think jazz is a big umbrella and all these things are a part of it. So I don’t know exactly where it’s going. I think the fact that guys are playing instruments, I think that’s a very particular thing. I would like to see people able to get proficient on instruments again. However, there are many ways that Jazz – capital “J” Jazz – can be expressed. And I’m sure it will be as long as there are people, as long as there’s life, there’ll be jazz.